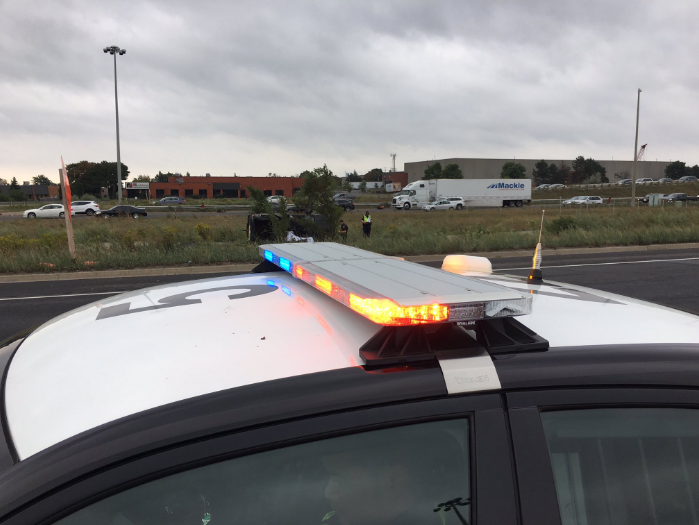 A 62-year-old Mississauga woman is dead and a 60-year-old Mississauga man is in hospital with minor injuries following a single vehicle rollover on Hwy. 401 Saturday. The victims “know each other,” said OPP Sgt. Kerry Schmidt, adding police aren’t commenting on the relationship or releasing names until family has been notified. The incident was reported at 8:43 a.m. along the eastbound Hwy. 401 express lanes at Hwy. 403 in Mississauga. That’s where a GMC Jimmy, which the man was driving, rolled over ,winding up in the grassy area between the express and collector lanes. The man was airlifted to hospital with serious but non-life threatening injuries. Another vehicle – a silver four-door sedan with a sunroof – may have been indirectly involved, causing the Jimmy to swerve, said Schmidt. The eastbound 403 ramp was closed until police completed their investigation in the afternoon. Anyone with information is asked to phone the Port Credit detachment at (905) 278-6131.